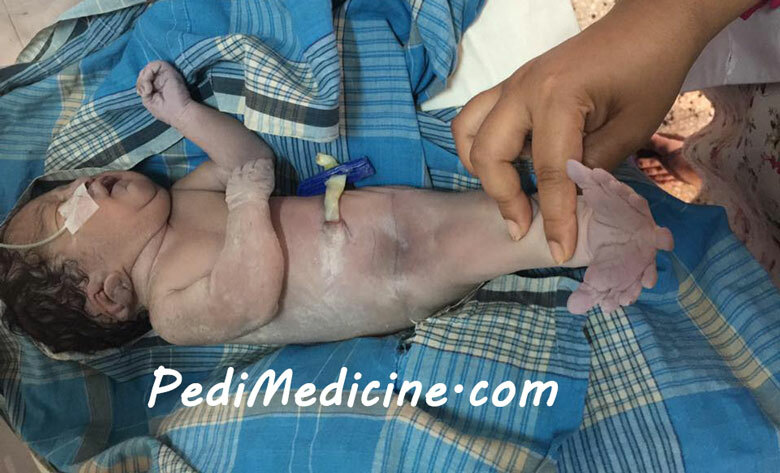 Very rare congenital anomalies Sirenomelia, alternatively known as Mermaid Syndrome, is a rare congenital deformity in which the legs are fused together, giving them the appearance of a mermaid’s tail. This condition is found in approximately one out of every 100,000 live births (about as rare as conjoined twins) and is usually fatal within a day or two of birth because of complications associated with abnormal kidney and urinary bladder development and function. More than half the cases of sirenomelia result in stillbirth and this condition is 100 times more likely to occur in identical twins than in single births or fraternal twins. It results from a failure of normal vascular supply from the lower aorta in utero. Maternal diabetes has been associated with caudal regression syndrome and sirenomelia, although a few sources question this association. I have found one similar case in Dhaka Medical College Hospital, the picture below.